The intent of these guidelines are to maintain the traditional spirit of the Pow Wow. The Committee strongly believes that the items sold at the pow wow should be truly representative of the Onkwehonwe culture. We have set these guidelines to encourage the sale of traditional products by Native North American individuals. All food booths must furnish and have on site a 10lb. ABC fire extinguisher in good working condition. We encourage the selling of natural and native food that are either made strictly with indigenous labor or that are considered specifically Indigenous foods, such as buffalo burgers, corn bread, corn soup, bannock, etc., although general fast foods such as french fries, hamburgers, hot dogs, sandwiches and soda will be permitted. However you must make it clear on your registration form what you will be selling. The Committee reserves the right to deny the sale of foods it deems improper. There will be close monitoring for cleanliness and proper food handling and storage. Vendors must carry enough supplies for the day because there will be limited movement of vehicles due to the confusion it causes at the gates. We encourage the selling of goods that are made using Indigenous labor, and should be representative of traditional skills and culture, such as beadwork, quill work, pottery etc. Items not to be sold include mass production or Japan imitations such as trinkets, etc. 1. 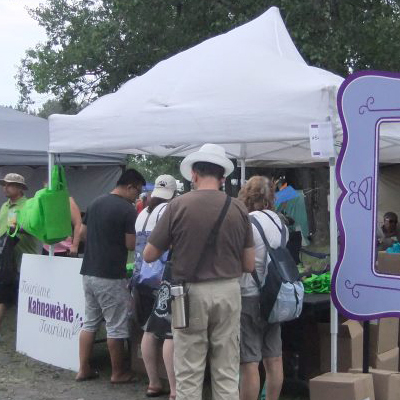 ALL VENDORS ARE REQUIRED TO CHECK IN WITH THE CRAFTS/FOOD VENDOR COMMITTEE PRIOR TO SET UP. 2. The Pow Wow Committee reserves the right to remove any item(s) judged to be in violation of this contract. Any Vendor/persons refusing to comply with a request to remove said items deemed in violation will be asked to leave. No refunds will be granted. 3. No Lottery or Raffle tickets allowed. 4. Rough setup may begin no earlier than Thursday – noon. All vendors must be set up for the general public by 9:00 a.m. on Saturday and Sunday. No vehicles will be allowed in your area after this time. 5. Craft booths may sell crafts only and food booths may sell food only. 6. No Alcohol or Tobacco products to be sold at the pow wow. This is a family affair, therefore for the safety of our families and elders, Alcohol and drugs will not be tolerated and will be strictly enforced by security. 7. Native North American vendors first and foremost. 8. No imported plastic, mass-produced or look-alike items. A partial list of prohibited items include, but are not limited to; rubber tomahawks, spears and the like, Nickel or rhodium jewelry imported beadwork or any other quasi Indian items. 9. No radios, microwaves or coffeemakers due to limited source of power. 10. Bring your own chairs, tables, canopies etc. 11. “Discount signs”, “reduced price”, “Sale”, “20% off” etc. will not be permitted. Sale techniques are found to be offensive to the general public and undermining to other vendors. 12. Contracted vendors may not sublet their assigned space. Sharing space will only be allowed by prior arrangement with the Pow Wow Committee. 13. Vendor participation is by invitation only, no one will be allowed to set up without an executed contract and payment in full. 14. Vendors must not use the “Echoes of a Proud Nation” name or logo on any items such as t-shirts, sweatshirts, mugs, buttons, keychains etc. 15. Vendors will keep booth and surrounding area free of debris and will be responsible for cleaning up their area before leaving the grounds. Vendors will utilize available recycling containers. 16. Please do not sell ceremonial items such as: corn husk masks, wooden masks, false faces etc…. Designed by Bear Design Co.